Looking around Lowe’s for suitable (read “cheap”) tubing that I could use to construct an organizer, I settled on two possibilties; 1½” EMT (Electrical Metallic Tube) conduit, and chain link fence top rails. Both are galvanized which was a negative, but the price was right with the fence top rail being about $2 cheaper for a 10′ section. 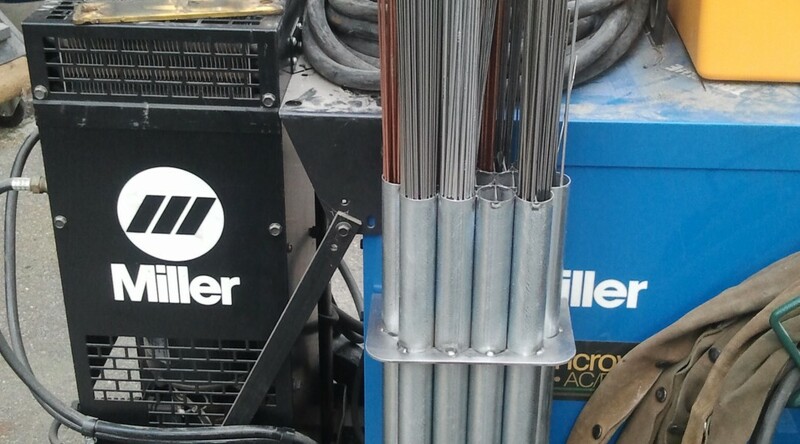 Dealing with galvanized is really no big deal, just be sure to weld in a well ventilated area and read this article before starting. I usually start with a solid model to work out the details, and in this case to generate the flat pattern to cut the top plate. I cut three pieces of top rail into twelve 24″ sections and one 12″ piece. 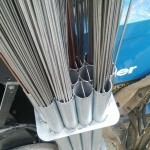 I also cut 6 dividers out of 18ga galvanized as close to the inside diameter of the tubing as I could get. 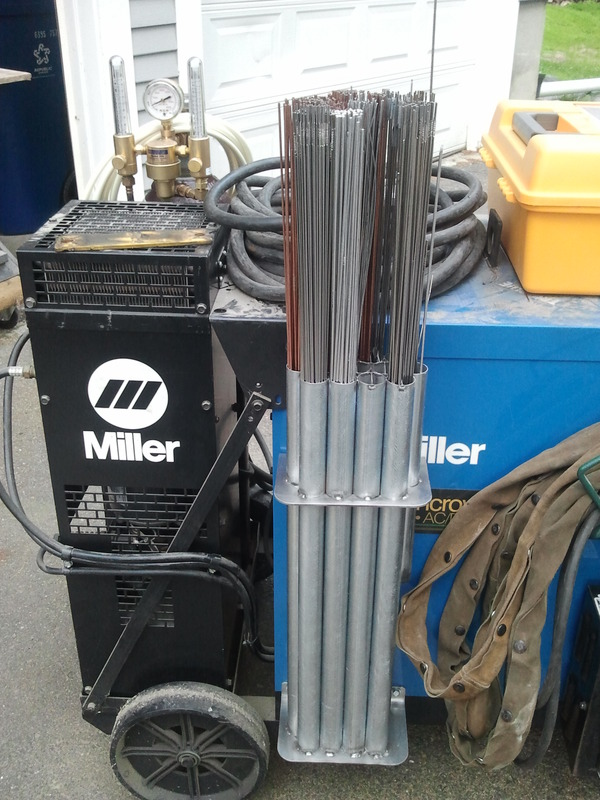 These just slip into the tubes and get tack welded at the top to divide a few of the tubes in half. 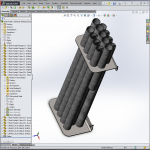 Each half tube has more than enough room for 1lb of rod, and each full tube will actually hold 10lb of steel or stainless rod. 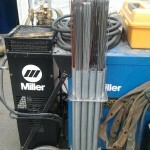 The short tube on the end is for those half used pieces that accumulate on the weld bench. Once all the tubing was cut, I then cut the top and bottom plates to size, rounded their corners and drilled the mounting holes. Next I cut out the scalloped hole in the top section to accommodate the tube stack and bent the lip on both plates. The inserts were tacked into six of the long tubes, and then pairs of tubes were tacked together. Two pairs of tubes were then tacked together to make three groups of four tubes. The short tube was then tacked to the end of one group. The three groups of tubes were stacked and welded together and the tube assembly was then welded into the top and bottom plates. 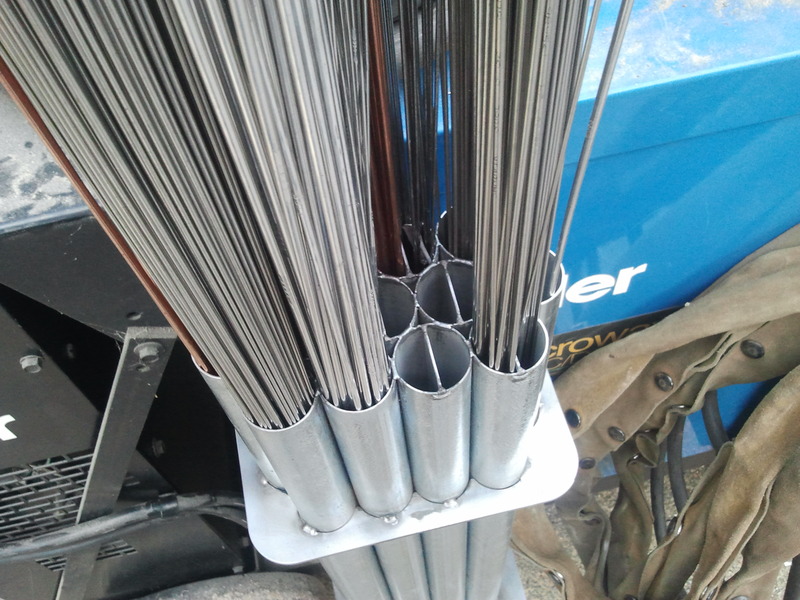 After I completed the holder, I realized that if the center tubes were a little taller than the outside rows, I could easily label all of the tubes with a Sharpie to identify the rod alloy. The CAD model reflects this changed.